Recently, a fellow showman and I were commiserating about the difficulty of accessing the web while on the road. He enlightened me with information about cellphone internet availability. Apparently, I am as behind the times as a fossil. There may be other comparisons as well. He also turned me on to the article attached. I was no less than enthralled. I first met Johann at the great Reading Fair  in the late sixties. He had a specially built Ford semi tractor with a raised roof to accommodate his great height. He was the proud new owner of a custom show wagon that was a trailerized exhibit with built in living accommodations designed to his great scale. My dad took me over to meet him , and I will never forget his handshake, how my youthful, yet large manly hand was completely swallowed up in his truly gigantic one. His grip was gentle, yet firm. He pitched rings that fit his finger, yet were large enough to be used as napkin rings. His new show trailer was a marvelous rig. 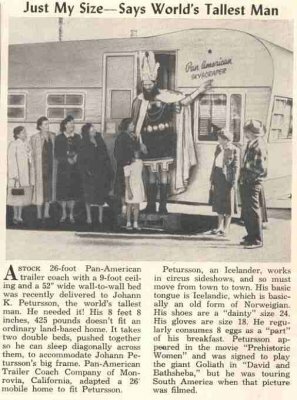 The front had “the Viking Giant” as the general theme. It was the most elaborate single-o I had ever seen. Around back, the entire side was framed like a joint trailer awning, with a canvas sidewall. Johann sat on a tall throne on a raised portion at the center of the trailer. He had enlargements of his movie posters on either side. When he stood and extended his arms, it was a sight comparable to the elephant long mount on Carson & Barnes , or perhaps a Zachini double cannon leap. I had seen him before as we were always around shows, but had never personally met him, my dad knew him socially from the club.